Welcome, steampunk explorers and gaslamp fantasy mad scientists! 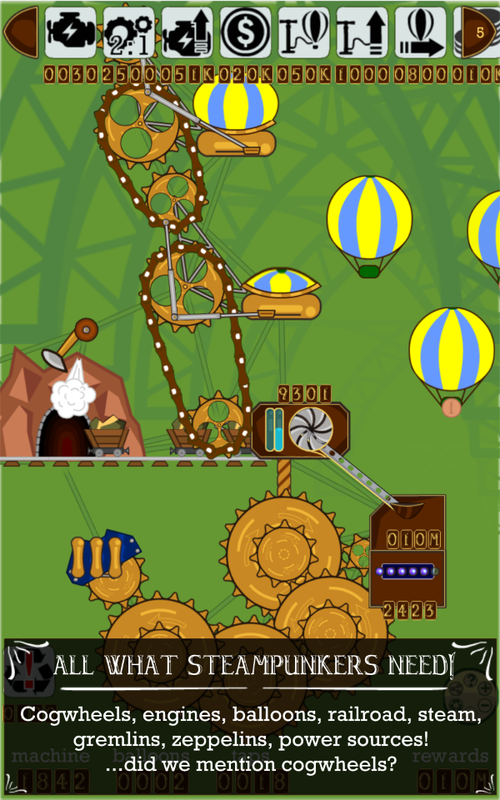 Here you'll find all the information to build the most efficient and incredible contraptions. The game testing started since June 2017. So, below information is left for the historical reasons. The most actual information is in the Wikia links above. 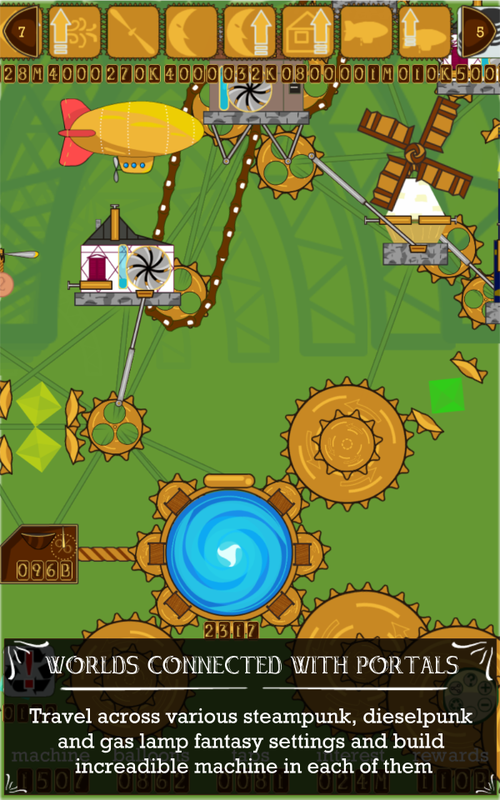 Steampunk Idle Spinner is a mobile Android game where you can build your steampunk machine with cogwheels, engines, transmission and other gear. The game has now gremlins, balloons and portals! Click here, if you are searching for the information about "20 000 Cogs under the Sea"
Facebook group: join the discussion and influence the future of the game! Tomasz Pietrzak - for streaming the game at Youtube channel! Cezary Goździk - for Polish translation and streaming the game at Youtube channel! Richard Hartemink, Zirk Seljee- for Dutch translation! Dank je! Tim Thevoz - for French translation. Merci! Spin the cogwheels with your finger. I'm tracking the time needed to build this game. For now I've spent more than 80 hours of pure coding. I'd be happy to receive your comments and suggestions. I assure you there will be no "premium only" items. My big concept is to let the players travel from one steampunk world to another for Narrativium they earn in the previous worlds. Right now there is only one world: "Workshop", but I'm going to add such settings based on "20,000 Leagues Under the Sea", "From the Earth to the Moon", "Journey to the Center of the Earth",also something like Sky Pirates etc. Going to expand the numbers list in the next update. For now, will you, please, check the game's facebook group- there we organize the feature requests, bug reports, and I show the current dev progress. There should be much smaller cogs so when next to a much bigger one it goes much faster. It appears like there's a bug with the balloon speed upgrades being lost after some time or several balloon merges. I haven't figured out how to reproduce it yet though. So, does an engine help if it's not at the end of the cog chain? Also, please give us the ability to move things, like engines or cogs. I hate having to scrap all my engines and pay inflated prices to rebuild every time I can afford another cog. I would like to see a feature where you can connect to cog chains to one cog. Then I can have a motor that powers that cog and the two other devices. Also i found another secret, the cheat menu! Cool! Will you, please, join the game's facebook group- there we organize the feature requests, bug reports, and I show the current dev progress. Actually I payed close attention. They make money machine bar 2x faster while green is filled. It requires money machine upgrade to see bar. Exactly! BTW you are welcome to check the game's facebook group- there we organize the feature requests, bug reports, and I show the current dev progress. Another question is does narrativium give any passive bonus? They cap the major boost from 4th upgrade at the 3rd ugprade for both it seems. Otherwise they don't have an upgrade cap. There is no limit for the upgrades: the engine visual is changed every 4 upgrades, but the engine speed is still increasing. Thank you forth bug report! Will you, please, join the game's facebook group- there we organize the feature requests, bug reports, and I show the current dev progress. I'm on the third loop, and it seems that the ability to place mines isn't always there when you unlock the mine. It will appear later, to the left of the coin generating machine. Right and I have millions and can select it but where do I place it. Most items have a lil white circle where I can add to machine. Idk where to put mine. You can see the portal when you get around 60 million coins (I think), but you can't buy it until you have 100 million. And now I'm working to let the player not only restart the game, but to travel to other steampunk (dieselpunk, clockworkpunk, gas lamp fantasy) worlds from the Portal. Anyone figure out what the coin colors and numbers amount to? 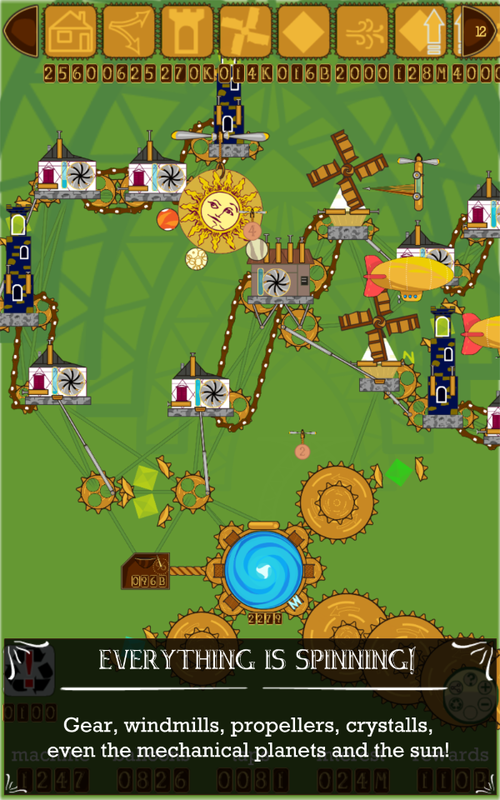 The mine produces the ore which boosts your Money producing machine. You can tap the mine to produce the ore faster, or attach a hammer to it. Is it a bug that cogwheels won't work backwords? No their not supposed to, because it would go against the way the engines and hammers turn the cogs. Sory I meant that the first cogwheel, turning the money mashine, won't turn the last cogwheel. If this isn't a bug, I think somting like toothed belts would be very cool. I have a problem were i can only have 2 portals after that the option goes away is this normal? I have the same problem about the "Z" coin. And i'm using this to produce more narrativium from "portal" because the money never ends. I break the game, too. I upgraded only one hammer from the mine a few times. So suddenly the cash was flowing in. Hi! Now working to make the third world, Floating Islands. Will you, please, join the game's facebook group- there we organize the feature requests, bug reports, and I show the current dev progress. I reached the limit ... I need an update pls. Its nice if cogwheel can combined or if i need a great cogwheel for more power or a small cogwheel for Speed u know ? Will you, please, join the game's facebook group- there we organize the feature requests, bug reports, and I show the current dev progress. And I have almost 1 mil coins aren't you supposed to be able to get it at the beggening of the game? The new update makes it so I can't move around on the screen anymore. Change it back in the settings menu then. When you add a new cogwheel, do you need sell and buy a new engine in order to take advantage of the increased ratio? Yes, it's good strategy! Will you, please, join the game's facebook group- there we organize the feature requests, bug reports, and I show the current dev progress. Does anyone know how to access the cheats menu? Well, it's our secret, but we have some hints in the game's facebook group- there we organize the feature requests, bug reports, and I show the current dev progress. I usually get it by just waiting. Thank you! Will you, please, join the game's facebook group- there we organize the feature requests, bug reports, and I show the current dev progress. How do you use a portal in clockwork city? Just kinda stuck at this point. It's just more expensive there: 100b coins. Will you, please, join the game's facebook group- there we organize the feature requests, bug reports, and I show the current dev progress. In Clockwok ville, there are'nt any power source to rotate the portal ?! Yes, crystal spins the cogwheels there. Will you, please, join the game's facebook group- there we organize the feature requests, bug reports, and I show the current dev progress. One bug: Crystal can't be recycled, and the only way to expand the geartrain is to put the new gear over the crystal. Thank you for report! Will you, please, join the game's facebook group- there we organize the feature requests, bug reports, and I show the current dev progress. Rather strange, thank you for report! Will you, please, join the game's facebook group- there we organize the feature requests, bug reports, and I show the current dev progress. Good suggestion! Will you, please, check the game's facebook group- there we organize the feature requests, bug reports, and I show the current dev progress. I "maxed out" clock workshops city and i have 2m navarium. Is there already a new workshop? Working to make the third world: Floating islands. Will you, please, check the game's facebook group- there we organize the feature requests, bug reports, and I show the current dev progress. Thank you! Will you, please, check the game's facebook group- there we organize the feature requests, bug reports, and I show the current dev progress. How do the mines work? You tap them (or attach the hammer), they produce wagons with ore, which boost the productivity of your money machine. Will you, please, check the game's facebook group- there we organize the feature requests, bug reports, and I show the current dev progress. Fun game! But I can't make a portal in the at and world, is there a fix? Thank you very much! Going to adjust the numbers list in the next update. For now, will you, please, check the game's facebook group- there we organize the feature requests, bug reports, and I show the current dev progress. Yellow submarine? Also is it possible for us to be notified on any new world leaks or just anything? wait will there be a unlocking system for worlds? finish the first world to use the second, and then finish the 2nd to unlock the third? Bug infinity money when the machine said your money is 000Z. So how does floating islands work? Good suggestion, will think of it! Hi I like this game, just wondering, after you buy something and place it, can it be moved later or do you have to sell the item? 1) figure a way to check the time if online as I was able to put my phone time setting so it was in the year 2021. Earnt a decent amount from that but it did ruin the point of idleness for me, I know it's my own fault haha. Can you also figure a cloud saving method in case players change devices? ia anyone still working on this game? Hm, that's strange... Could you, please, send me the screenshot? how can i add airships bite? In what world are you playing? it is appeared but when I dragged it, anything are not appeared. where can i add? And making 0 per second even though i clearly am. What do I do with 13M gold. I already have like 3 of every machine. Since no belts to connect machines gears I just use multiple coal engines. Nice game, kids love it thnx. Well, I broke the beginner world. Built a mine. Built one hammer on it. Upgraded hammer repeatedly. Money glitches to zero and coins stop when you get to hammer level 250ish. Think my money hit infinity. i had to reset without a portal:-(. how do i never let that happen:-(. Comment on fait pour retourner à l'atelier quand on est dans le monde des île flottante ? ?